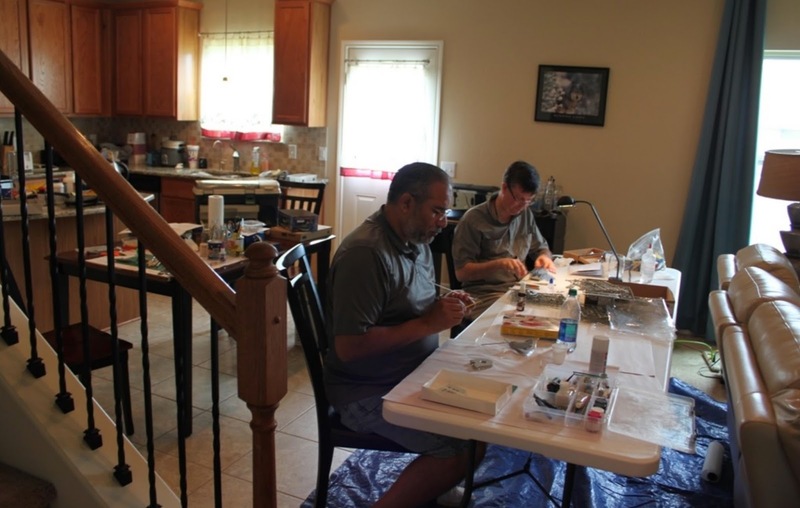 Our hobby tends to be a solitary one, each of us building models alone in our workshops. We come together only for club meetings or contests. When I lived in Ohio my friends and I would occasionally get together to build models, sharing ideas and techniques, or to simply make modeling a social experience. I don’t have any modeler-friends near my today, so it’s great to see other modelers coming together from time to time. This article by Craig Gregory originally appeared in the August 2016 issue of The Navigator, the monthly newsletter of IPMS/USA Alamo Squadron. My thanks to its editor, Len Pilhofer, for allowing me to share it with you. On Saturday, July 9th and Sunday, July 10th I hosted a bachelor build weekend at my house; as my wife was visiting the East Coast with her relatives from China. There were three of us on Saturday; one started a new tank project, another a new aircraft build, while I continued working on an aircraft and a starship projects. I also BBQ hamburgers, while others brought the associated sides. I am of the opinion that meeting once a month for a club meeting is not enough. I am always looking for other ways to learn more about our hobby and meet others. Hosting the bachelor build weekend accomplished both goals. There is no better way to learn than to see it happen; and then to do it yourself. And no better activity that to share with others. What did I learn? I learned that a tank has a hell of a lot more parts that a typical aircraft kit. To me, building models with friends is the ultimate form of joy! We just had our 2nd club build day for the year. These are held twice a year - May and September - on a Saturday and run from 10:00am to 10:00pm with dinner provided. We usually have about 10 members turn up at various times during the day, but this time attracted 13, which was extraordinary. It's always a great day with lots of projects on the go as well as a lot of banter and discussion. We started the build days 2 years ago, they have become very popular and along with our annual 2 day modelling retreat - which is held in August - have become a firm fixture on our club calendar.